Richard Jones´ production of Lohengrin in Munich was The Wagnerian Talk of the Season 2009-10﻿ mainly as this was Jonas Kaufmann´s debut in the title role. As well as his first major role in a new production in his home-town Munich, where he was never recognized until he undisputedly had made his name elsewhere. It seems like Richard Jones concept evolves around an ironic interpretation of the bourgeois dream, of a traditional living and family, with Elsa and Lohengrin quite literally building a house together dressed as carpenters. A house, which Lohengrin eventually sets on fire when he leaves. Now, I have seen several productions by Richard Jones, which work. Most notably a superb Rusalka in Copenhagen a couple of seasons ago. Thus speaking, he is capable. So, one wonders what òr who on earth made him think that extracting all the interpersonal drama replacing it with something as boring as watching people building a wooden house works? To be answered clearly: It does not work. Some free advice: Forcing a fixed idea onto an opera with no seeming interest in the personal relations almost never works. Jonas Kaufmann was exactly the stellar Lohengrin he was made out to be – romantic, present, and with a barytonal sound, that I honestly prefer. He doesnt always sound entirely effortless, but neither did Domingo in his prime. Please, could we see Jonas Kaufmann in another production? Anja Harteros received unanimous praise for her Elsa, both during the run of performances and for this DVD. As for this DVD, I simply do not agree. She has the bloom and the legato lines, but for me, the two major detractors about her singing is 1) she basically leaves me cold and 2) she is singing out of tune. As for 2), she may have had an off night, as her intonation has been spot-on the times I have heard her live, but “einsam in trüben tagen” was about 1/4 note flat more often than not. Admittedly she warmed up during the 2nd act, but I am really allergic to singers being flat. The former Munich opera intendant found the originally contracted Waltraud Meier too old for the part and replaced her with the passable, but nothing more, Michaela Schuster. Crazy. However, the new intendant does not agree, so now one may see Waltraud Meiers Ortrud in Munich. Also crazy that the producer didn´t chose another night for filming Telramunds major scene, Act 2 scene 1, as the otherwise competent Wolfgang Koch was about a tact behind the conductor at several of his outbursts. Kent Nagano is far better here than on his previous DVD from Baden-Baden, less restrained, with more passion – hovewer his transparency will never put him in the league of great Wagnerian such as Thielemann or Barenboim, just two mention two currently active. So unless you are a die-very-hard fan of Jonas Kaufmann, look elsewhere for a Lohengrin on DVD. For any Wagnerians who’ve been slumbering, Fafner-like, in their caves during the last few years, here’s your wake-up call: Jonas Kaufmann is the tenor we’ve been waiting for. He has a voice reminiscent of the young Jon Vickers, but with more warmth and Mediterranean luster, and the kind of matinee-idol looks and committed acting that make him a compelling presence onstage. Kaufmann outclasses all of his current competitors in the heldentenor stakes. A new DVD of Wagner’s “Lohengrin” from the Bavarian State Opera’s 2009 Munich Festival (Decca DVD 074 3387), with Kaufmann in the title role, displays his gifts at their most magnetic. The sheer heft and beauty of his sound, his command of legato, his ability to dial down his voice to the tenderest whisper — these are qualities as rare in today’s Wagner tenors as are the emotional engagement and moment-to-moment responsiveness of his acting in the third act’s love duet, or the age-appropriate, romantic figure he cuts throughout. Happily, Kaufmann’s Lohengrin is partnered by an Elsa fully up to his standard — soprano Anja Harteros, whose luminous, warmly communicative singing has one reaching for golden-age comparisons like Elisabeth Grummer and Maria Muller. 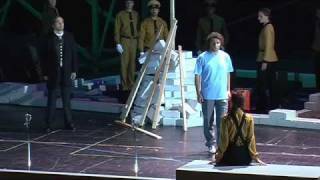 Wolfgang Koch’s powerfully sung Telramund, Michaela Schuster’s Ortrud (wonderfully detailed in her conniving allure, and relatively free of the harshness so many mezzos bring to this role), Christof Fischesser’s anxious, supple-toned Heinrich, and a notably forthright Herald from Russian baritone Evgeny Nikitin complete this unusually fine cast. Kent Nagano conducts the Bayerisches Staatsorchester in an expressively molded reading that balances power and chamber-music detail. Thought-provoking, to be sure, but the staging has its distracting and heavy-handed moments. Even so, Wagner lovers allergic to this European brand of deconstruction are advised to simply close their eyes. On no account, though, should Kaufmann’s standard-setting performance be missed. A wonderful bad production. Richard Jones’ Lohengrin at the Munich Opera Festival forcefully makes the point that it’s possible to warm even to a bad idea. The bad idea? Overusing the building of a house as a — far too simplistic — metaphor for the opera’s admittedly odd story. Worse: Jones mocks his own direction through strained ironic distance, lest anyone accuse him of taking Lohengrin seriously. Lohengrin’s duel with Telramund is a cartoonish cutlass-ballet that makes Errol Flynn’s such seaborne adventures look of positively Olympian restraint. And while Ortrud using Telramund’s gun to kill herself is an inspired touch, having the entire Brabantian chorus off themselves in identical fashion makes an extraneous point — perhaps about losing freedom and fearing the new, old, totalitarian order under Führer Gottfried — that contradicts, not enhances, what the text and music tells us. Scenes to which closing your eyes won’t do; eliciting, if perhaps not demanding, the audience’s juicy boos after the first and third act. For the many who gained nothing from Jones’ overarching idea, there were the singers to enjoy, their acting, and the direction’s superb craftsmanship. When has there last been a cast so good, young, and homogenous for a production of Lohengrin? From Christof Fischesser’s virile king to Evgeny Nikitin’s sung (not belted!) Herald, to Michaela Schuster’s curiously seductive, finely frayed Ortrud, and Wolfgang Koch who makes a believable, euphonious Telramund, it was the even excellence of the singers that makes this Munich Lohengrin a feast for the ears. Anja Harteros outshone even Jonas Kaufmann. Apart from singing with unlimited reserves of steeled luster, she pulls off being hopelessly adorable in ordinarily unflattering overalls, handling a bricklayer’s trowel. Her Elsa defiantly ignores the accusations hurled at her, insisting on building her nest … err, house. Fortunately she gets a handy-man helper in the form of Kaufmann, whose gritty and earthly Lohengrin makes an ideal partner-in-masonry. The setting is an odd mix of a 1960s collegiate society with the red-headed men in their Brabant-High letter jackets and wavy hairdos and a vaguely fascist Telramundian regime. Costumes and set are by “Ultz”, lighting by Mimi Jordan Sherin. Building the new house – …that is post-dictatorship Germany? – the society changes into loosely Swabian costume when they consecrate Mr. & Mrs. L.’s new abode, replete with a cradle that Lohengrin incinerates when the relationship fails. While the metaphor of the house is by now stressed well beyond breaking point, it works rather well as a set, populated with two such consummate actors who turn Lohengrin into an intimate story of love-gained-and-lost. The interplay of the couples, Ortrud and Telramund, Lohengrin and Elsa, is defined by great sensitivity and moving tenderness … alas, what Richard Jones giveth, Richard Jones taketh away when he insists on instilling extraneous ideas that don’t organically develop from the story. Den besten „Lohengrin“ hört man derzeit in München. Jonas Kaufmann triumphiert in der Titelpartie, und das Publikum schwelgt im Glanz luxurierender Stimmen. Die Regie von Richard Jones aber erzählt eine traurige Geschichte aus der Mittelstandsgesellschaft. sste Richard Jones, als er die Regie für den neuen Münchener „Lohengrin“ plante, wie das Motto der Opernfestspiele lauten würde, „under construction“ nämlich? Dass die Oper eine Baustelle ist, zumal diese, Wagners allertraurigste Desillusionierungs-Handlung, mag eine Binsenweisheit sein – hier wurde es, im Bühnenbild von Ultz, sehr buchstäblich genommen. Die Bühne stellt nämlich kein noch so entferntes Brabant dar, kein Scheldeufer, sondern meist tatsächlich eine Baustelle, ansonsten einen schlichten, mit allerhand Zunftzeichen karg geschmückten Versammlungsraum. Schon durch die Massenaufmarschmusik zu Beginn, als König Heinrich (von Christof Fischesser mit kraftvollem, nie dröhnendem Bass gesungen) vor seine Leute tritt, schleppt Elsa, eine wackere Pionierin mit Zöpfen und Latzhose, Steine nach hinten, wo sie, ganz welt- und selbstvergessen, vor sich hinwerkelt: Weiß sie, was sie dort baut? Wir wissen es, denn schon zu den ersten Gralsklängen, die Kent Nagano mit dem Bayerischen Staatsorchester silbern irisierend aus dem Nichts zauberte, konnte man ihr bei der Entwurfsarbeit am Reißbrett über die Schulter schauen. Diese Elsa aber träumt keine Gralsburgen oder sonstigen Luftschlösser, bloß ein Eigenheim, wie ein Kind ein Eigenheim malt. Entsprechend bodenständig, ein Lockenkopf mit T-Shirt und Freizeithose, erscheint also der unbekannte Herr Lohengrin, rätselhafterweise mit einem Schwan im Arm. Auch dass hier bald ein „Gottesgericht“ um die in Frage gestellte Ehre des Mädchens Elsa durch Schwertkampf veranstaltet wird, mag verwundern. Immerhin, wenn Herr Lohengrin den Widersacher Telramund besiegt und als „Schützer von Brabant“ gefeiert wird, kommt hinten die Arbeit auf der Baustelle mächtig in Fahrt, heia! fliegen die Ziegel, rasen die Schubkarren, Stein auf Stein wächst das Werk. Wie bei diesem Richtfest Pathos und Schwung der Arbeit am Bau mit Wagners hochfahrender Musikarchitektur gleichsam liturgisch zusammengehen, das löst die ja immer auch etwas hohltönenden musikalischen Staatsaktionen auf verblüffende Weise in wohltuend milde Ironie auf. Weil aber, so wenig sich die Regie sonst um eine alleserklärende Handlungslogik kümmert, das Bild vom Bau durchgehalten wird und Lohengrin auch später nicht als strahlender Ritter, sondern mit Zimmermannshose gezeigt wird, entlädt sich am Ende gewaltiger Unmut über den Verantwortlichen. Man fühlte sich wohl betrogen, nicht nur um den Ritter, sondern überhaupt um das Wunderbare, an das man, so aussichtslos sein Dauern im wirklichen Leben auch bei Wagner schon erscheint, so gern doch immer noch glauben möchte – und sei es bloß in der Oper. Dabei ist, was die musikalische Seite betrifft, derzeit schwerlich ein besserer „Lohengrin“ zu hören in der ganzen weiten Wagnerwelt. Das liegt nicht nur an Jonas Kaufmann, dessen luxuriös farbenreicher Tenor – wiewohl am Premierenabend nicht einmal optimal disponiert – noch aus der hochgetriebenen Bruststimme einigen Glanz entfaltete und der sich insgesamt mit diesem Rollendebüt für das noch prominentere bei den Bayreuther Festspielen 2010 empfahl. Wozu dieser Sänger fähig ist, wurde erst im dritten Akt ganz deutlich, als er sich weiter ins Kopfregister wagte und vor allem in der Gralserzählung einige tatsächlich überirdisch schöne Töne hören ließ. Hat man, als er dann Abschied nehmen muss, weil Elsa einen namenlosen Gatten im fertigen Heim nicht hinnehmen kann, je einen traurigeren Helden erlebt, wie er da einfach auf einem Stuhl sitzt und vom Gral und seinem Vater Parzival erzählt und dass jetzt alles Glück dahin ist? Spätestens jetzt erweist sich, was für eine abgründig deprimierende Geschichte hier erzählt wird, jenseits aller Späße und britischen Ironien. Elsas Eigenheimtraum wird nämlich gerade nicht als schnöde Mittelstandsidylle denunziert. Wenn sie mit ihrem namenlosen Zimmermann „zum ersten Mal allein“ ist im Echtholzheim, wenn das Doppelbett bereitsteht und sogar schon die Wiege im Kinderzimmer, wenn also das schöne Leben anfangen soll, dann ist im neuen Münchener „Lohengrin“ zu sehen, wie zwischen Menschen ein unheilbares Unglück entsteht – millimetergenau, wie am Reißbrett: Man sieht es genau und bekommt doch keine schlaue Antwort darauf, woher es denn kommt. Dass diese Szene im Kiefern-„Brautgemach“ zum Zentrum der Aufführung wird, liegt wesentlich an der phänomenalen Anja Harteros. Sie singt und spielt die Elsa mit großem Ernst, hinreißender Klarheit und Innigkeit. Schon wenn sie im ersten Akt den gerade aus dem Nichts erschienen Schwanenmann mit einem Oktavsprung auf ein traumhaft leises ‚a‘ als „mein Erlöser“ ansingt, ist das kein Kitsch, auch nicht nur eine musikalisch „schöne Stelle“, sondern die reine Wahrheit. Überhaupt wird außerordentlich gesungen. Michaela Schuster hat für die böse Ortrud tausend Töne der Verschlagenheit und zeichnet mit wohldosierter Schärfe ein fesselndes Rollenporträt. Wolfgang Koch, Genosse ihrer Schmach (in München hörte man das Wort meist als „Scha-mahch“), beeindruckt als mächtiger, dem Schauspieler Bierbichler nicht unähnlicher Telramund und tut der vokalen Differenzierungskunst vielleicht schon zu viel des Guten. Evgeny Nikitin ist ein angenehmerweise nicht blöde lautsprecherischer, sondern musikalisch gestaltender Heerrufer. Auch die von Andrés Máspero einstudierten Chöre sangen bis auf kurze Kontakt- (vermutlich Sicht-)probleme erstklassig. Nach schwerelosem Beginn dirigiert Kent Nagano einen zupackenden, erregt durchpulsten „Lohengrin“. Dabei ließ er seinen Sängern, aber immer wieder auch einem sprechenden Oboen- oder Klarinettensolo, einer tieftraurigen Cellostimme Raum und Luft. Gelegentlich geriet das Trompetengeschmetter im Nationaltheater auch zu laut. Wollte Nagano, dass es bis vor das Haus zu hören war, wo sich Tausende versammelt hatten, um auf einer Großleinwand „Oper für alle“ zu erleben, dem bayerischen Starkregen tapfer trotzend? Als die Sänger auf der Freitreppe erschienen, brandete Jubel auf und flogen Luftballons. Drinnen auf der Bühne hatte sich eben noch das Chor-Volk, mit dem letzten Wort „Weh!“, kollektiv Pistolen vor den Kopf gehalten. Were someone looking to assemble a musical Dream Team to thrill us to the core with Wagner’s Lohengrin, one would need look no further than the assembled forces currently on stage at Munich’s Bavarian State Opera. Interest was extremely high, of course, in local boy Jonas Kaufmann’s first take on the title role. We were amply rewarded. For Mr. Kaufmann has it all, the mettle and the metal, starting with a robust, baritonal timbre in mid and low-range that loses none of its buzz as he ascends above the staff. His sound technique and focused tone allow him to not only ride the full orchestra as required, but also to scale back to intense, melting piano singing that lovingly caresses the more tender and introspective moments. If In fernem Land had been any more hushed or unearthly beautiful, my heart would likely have stopped. Magnificent. Add to this, the fact that Jonas is strappingly handsome, eminently stage-wise, and always engaged with his colleagues, and you begin to know that this is a major star in a major step forward in his career (although maybe he should resist doing the part in a house larger than the Staatsoper until he sees how it wears on him). You can also understand why savvy record promoters would perch him atop a mist shrouded summit, Caspar-David-Friedrich-like on the cover photo of his new CD release and declare him “Germany’s most beautiful voice.” The partisan Munich crowd who loudly celebrated his achievement would have agreed. But this our soprano did not do, regaling us with a text-book display of impassioned, controlled, varied, yet always lyrical Wagnerian styling. It was interesting too that her voice had been so Italianate in the Verdi, yet here was sometimes deployed with straighter tone, in more conversational delivery. She also looked beautiful, and was a vibrant stage creature that perfectly complemented her leading man. This pairing of Kaufmann and Harteros will likely be celebrated by aficionados for a long time to come. But although the duo set the bar very high indeed, the rest of the cast was up to challenge. Wolfgang Koch beautifully sang the role of Telramund with an incisive baritone, making music of the many outbursts that most usually shout. Michaela Schuster blazed through Ortrud with relish and imposing vocalism. If her securely hurled upper phrases occasionally tended toward stridency, it perfectly suited this character, and contrasted well with the pristine Elsa. As usual, Christoff Fischesser was reliably solid as the King, and in what is rather a throw-away role, Evgeny Nikitin was a surprising treat with his well-sung Herald. To say that the orchestra had the finest night I have yet heard from this talented band is a credit to the consummate leadership of conductor Kent Nagano. It is hard to believe that this was my first “live” encounter with the maestro, but it will not be my last. Mr. Nagano led a seamless reading, eliciting spot-on ensemble attaci from all the banks of instruments (especially in those difficult expansive unfolding preludes). The brass were in fine form — nay thrilling form — and the strings just glowed as they poured out arching phrase after arching phrase. The maestro’s attention to detail highlighted several voicings and solos that were absolutely fresh and pleasing to discover. It was curious that, having snuck onto the podium for Acts One and Two, negating audience “entrance” applause, Mr. Nagano threw that to the winds for a triumphal march into the pit at the start of Three. If he was, as I suspect, approximating the Bayreuth experience (where we don’t see the conductor until the call), why not be consistent? But that is minor, extra-musical carping. The orchestra under Kent Nagano (and chorus, directed by Andrés Máspero) were world-class, festival-class, you-name-it-class … they were of the highest class. Whatever one might think of the process of watching this house (aka new social order) get actually built over the course of the opera, or of having Elsa in work clothes laying bricks, this was a hugely impressive set design from Ultz, who also contributed the effective costumes. By the end of Act Two, a complete two-story chalet with balcony has been constructed and a turntable spins it around for us to admire. And then … even as it spun … the vociferous catcalls began. (Oh, dear, and a whole act to go!) I can appreciate that the visual embodiment of the “construction” may have been heavy handed, and that some may have wished for a design more akin to a period Belgian tapestry (and perhaps Lauritz Melchior back to sing in it), but really, I found that this was a handsome, very polished design that was considerate and consistent. Moreover, it was beautifully lit by Mimi Jordan Sherin, who took advantage of its natural color to unleash a full palette of evocative lighting effects on it, abetted by videographer Silke Holzach. Only the projection of the rising horizontal green and black lines (like an old TV test pattern) was of perplexing intent. Director Jones was a master of clarity and focus. All the while the stage was peopled with extras building the house, we were never distracted, and the characters always interacted meaningfully. Among the beautiful touches was having Lohengrin arrive bearing the swan as if being led by it. And having him carry a baby crib to the wedding house’s upstairs room, only later to put it on the bed and torch it, after Elsa’s betrayal (shades of Waco!). In fact, cultism seemed to be more the new order than any ideal of Elsa’s. At the start, the citizens were dressed in stylized blazers and faux folk dress, with the men’s hair swept up and out like an old hood ornament on a Chrysler. Very Flemish kitsch-inspired. Then Lohengrin arrived in a modern pale blue tee shirt and jogging pants with a silver stripe. In a visual irony, the citizenry became converts to Lohengrin/Elsa and donned blue tees, while the love couple got wed in rather traditional folk dress. As Ortrud offed herself and the chorus followed suit, there were echoes of Jonestown, underscoring the occasional peril of following charismatic leaders. This was richly complicated imagery and it not only complemented Wagner, but really it represented his intent. Did everything work? No. The goofy duel between Lohengrin and Telramund looked like un-coordinated pre-pubescent boys flailing Star Wars light sabers. And the moment misfired when Telramund rushed in to murder the hero, with Elsa standing on the wedding bed and brandishing a sword, and Telramund falling dead without having come anywhere near the lethal weapon. Spatially, it made no visual sense. Still, at the end of the day, this Lohengrin was always interesting, if occasionally flawed work from a very talented production team, well served by a cast and orchestra who were utter perfection. And isn’t that ample cause for rejoicing? Also available as commercial video recording.